Ignorance Made Us Hungry: Google's Favored Results. Somebody I follow on Twitter posted something about taking the bar exam, and, as I often do, I had the urge to Google the term I had just read (even though I know what the bar exam is... I was just interested, okay?). Okay, I'm looking at the results, and I'm sort of baffled to see the Florida bar exam as the second result (I put the light yellow highlight there. The top highlight was automatically on the screen). Hmm. Florida. That's where I live. Coincidence? Is our bar exam really special or something? I decided to further investigate this matter. So, to be safe, I open a new Firefox browser window and avoid signing into Google (while writing this, I just realized that I have Gmail notifier on my desktop... this could be affecting things... I will test that hypothesis soon...). Okay. 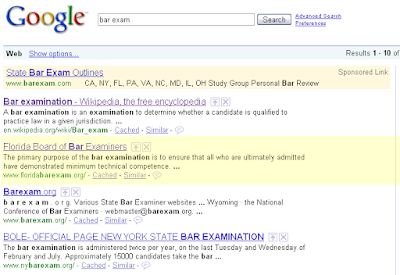 So either Florida bar exam is really a top result, or else Google still knows where I live without being signed in. Fine. 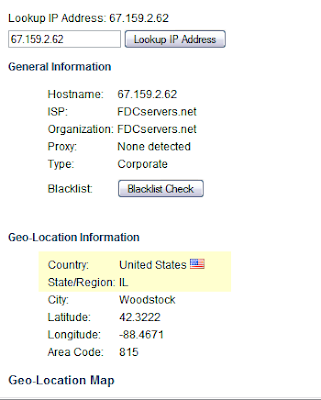 I learned about anonymous proxies over a year ago -- they are servers hosted in different places that allow you to first connect to someone's established server and then connect to the internet. Theoretically, this would allow you to connect to sites that have been blocked or restricted at your IP address (you would be sort of adopting someone else's IP for a while... I think that's how it works). This site called zend2.com (pic above) did not have the Florida bar exam in the first three results (it was still on the first page of results, though). Neither did the-cloak.com (pic above). But you'll notice something else... at the top right, you can see that the number of returned search items is significantly lower through these proxies than it was normally. 936,000 results for the proxies; 2,260,000 normal returns. It only took me one more try to find another anonymous proxy that would return the original number of results. I also did it in Internet Explorer, just for kicks. 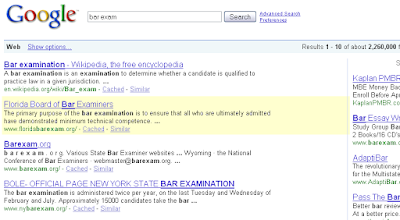 The anonymous proxy based in Illinois... had a paid ad result from... Illinois bar exam. -Google might change results without you even signed in. Weird, but, I guess, understandable.